The fighter hymn “Boys ‘n‘ Men“ is released today June 15th, as first single from the in August upcoming KAMIKAZE KINGS album “The Law“. “Boys ’n’ Men“ is available now at all download stores like iTunes, Musicload, Amazon MP3 etc. 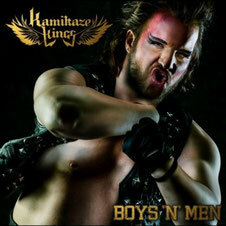 as a single and includes the doomy semi-ballad “The Dream Is Dead“ as a bonus track plus the music video “Boys ‘n‘ Men“ in the single version is presened by world exclusively German Metal Hammer. “Boys ‘n‘ Men“ is not only rocking, but it is also a great entertainment for people, who are not of a tender or weak nature! These four Berlin guys don’t only know how to act controversially and nonconformally on stage, but also at the big screen. The new video clip of “Boys ‘n‘ Men“, directed by Kornelius Glaser polarizes and captures you in all its intensity and visual impact which makes KAMIKAZE KINGS appear in an extraordinary apocalyptic, surreal light which reminds you of the comic world of Frank Miller.